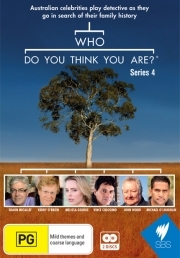 This entry was posted in Family History and tagged Australian family history, WDYTYA by cassmob. Bookmark the permalink. how cool there is a song about “the fella from Cunnamulla” !! thought of “(in)famous bushranger Thunderbolt” – in many years – passing his region. Was he a problem to my ancestors? – need to chk the Trove. Even if our ancestors had nothing specific to do with our families, it’s worth knowing how he might have impacted their lives indirectly. Love that I’m not the only one enviously watching how effortlessly and instantly (?!) the records appear from the stacks in WDYTYA! Pauleen WDYTYA is also a must watch for me although I have to watch the online video as I am still at work when the TV show is on. I have to admit to the envy as well. I’ve not heard much about Thunderbolt the bushranger. I come from Ned Kelly country 🙂 and got excited when a family member told me a story had been passed down their line that my ggg grandparents had paid a fine/bail for Ned’s mother’s after one of the “run ins” with the troopers. It would surely be interesting to know the truth behind that family story wouldn’t it Kerryn? Those copy-and-paste trees make me want to tear my hair out. And cited sources/references (if any)? Oh, someone else’s unsourced tree. Argh! Still, I’m glad that episode gave you some interesting thoughts about your own research. Sometimes it’s just better not to think too hard when watching them 😉 Perhaps because it’s Australian-based research I usually find it interesting though. Oh, yes, I agree that it’s interesting to see the research and with any luck a few tips get passed on… but it’s entertainment, really. Best to take the genealogy hat off when watching, maybe? Yes, I guess we’re just too experienced at this game…I’m sure it’s partly what draws new people in. I don’t think it’s silly at all Pauleen I often wonder who my ancestors ‘rubbed shoulders’ with. I recently found out that a cousin used to attend an Adelaide art society with Sir Hans Heysen. It’s these and other simple or funny anecdotes which keep me looking for more. They certainly add to our knowledge and understanding of our ancestors, don’t they Kylie? Fancy knowing Sir Hans Heysen. These snippets are every bit as revealing as someone’s BDM data.